This curry is Gujarati comfort food. The lentils dissolve into the sauce giving it a thick, mellow texture and the lamb melts in the mouth. 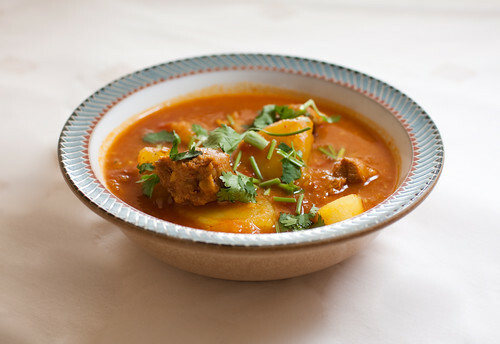 The "Can do lamb curry" posted previously is a Northern Indian dish and has quite a different flavour. I would be interested to know which dish you prefer. 500g of lamb in 1 inch cubes – I prefer neck fillet but leg or shoulder is fine. Note: You’ll probably have to pick up the toor dahl from an Indian grocery shop. It has lots of other names: Split pigeon peas (English), tuver dahl (Gujarati), tuvaram paruppu (Tamil). If you have a choice between oily or un-oily then go for oily but don’t worry too much. Put the dahl in a bowl and cover with water. Leave to soak for 30 minutes. Wash the lamb and place in a large stockpot along with the onions, tomatoes, chilli powder, turmeric powder, coriander-cumin powder, salt, vegetable oil, garlic and root ginger. Drain the dahl and add it to the pot. Mix everything together and then cook on a medium heat for 15 minutes, stirring occasionally. Add the boiling water and put the lid on the pot. Let everything simmer until the dahl has melted into the sauce. This will take approximately 60 minutes. Taste the sauce for seasoning and add more salt or chilli if required. Add the potatoes and continue to cook the dish until the lamb is tender and the potatoes have a very soft texture – probably another 1.5 hours. Remove the lid of the pot for the final 30 minutes to make it thicker. However stir regularly during this time. If you find that the sauce has thickened enough for your tastes then put the lid back on for the remaining cooking time. I'm confused, on Step 2 do you cover everything in water? Or do you just cook it for 15 minutes like that with only the tablespoon of oil? Reena, Can't wait to try this! Sounds like a yummy dish. Glad I stumbled on your site. I'll give it a whirl this weekend. Week 2: Steve sugegsted this in week 1 but my wife isn't a lamb fan, i think we might have a convert. Not only did she love it she had seconds. This seems to get better and better, what for week 3?